The LT looking north with the new support building providing workshop and storage space in the foreground, partially hidden at right (click for bigger). IO:O, the optical arm of the Infrared-Optical suite of instruments, mounted in place at the optical axis port of the telescope. In 2012 the Liverpool Telescope (LT) continued the trend of improved performance and reliability seen in recent years. Indeed, over semesters 12A and 12B the LT recorded a rate of just 2.4% lost to technical down time. This is a quite remarkable statistic when one considers that the LT is robotically controlled and its instrument suite is under constant development. 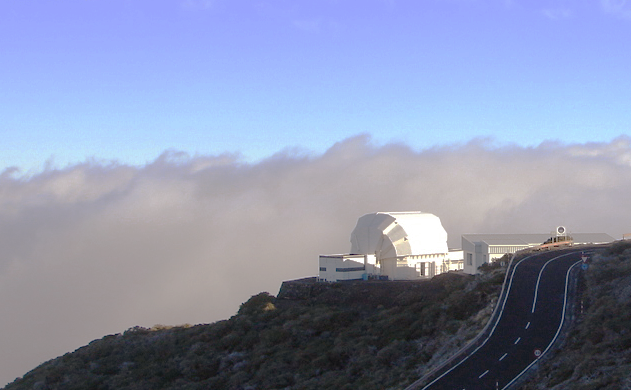 Nobody is available at the telescope to flip a switch or reboot a computer, so faults occurring in the wee small hours typically result in the loss of the rest of the night. In terms of new instrumentation, the development team at the Astrophysics Research Institute (ARI) in Birkenhead have been working hard to fully commission IO:O, the optical arm of an ambitious instrument that will eventually encompass optical and near-infrared imaging, as well as a fast-readout camera dubbed THOR. 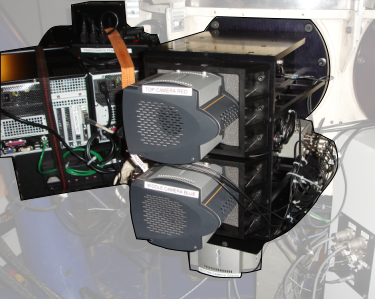 The expectation is that IO:O will replace the current work-horse imager, RATCam, for all optical imaging and photometry, in the latter half of 2013. 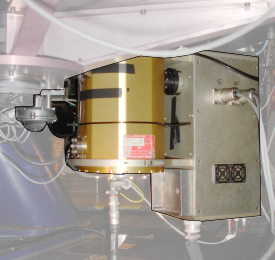 At the same time, the LT's imaging polarimeter, RINGO2, has been upgraded with the addition of a third camera. RINGO2 has morphed into RINGO3, which now offers simultaneous polarisation measurements in three optical wavebands. RINGO3 is already being used by ARI staff to observe and monitor the polarization of light emitted by Gamma Ray Bursts. In 2012 the LT tackled a broad range of science programmes, while at the same time supporting the National Schools Observatory by obtaining literally thousands of images for school kids across the country. For the scientists, targets as diverse as Type Ia supernova, asteroids and comets, galactic novae, exoplanets orbiting nearby stars, distant quasar candidates, Active Galactic Nuclei, and gamma-ray Blazars were observed. Many of these targets were observed repeatedly as part of monitoring campaigns, at short notice as Targets of Opportunity, or at specific times when events (such as planetary transits or occultations) were forecast to occur. All of this happens without real-time human intervention, and is further testament to the reliability of the LT's robotic control system.